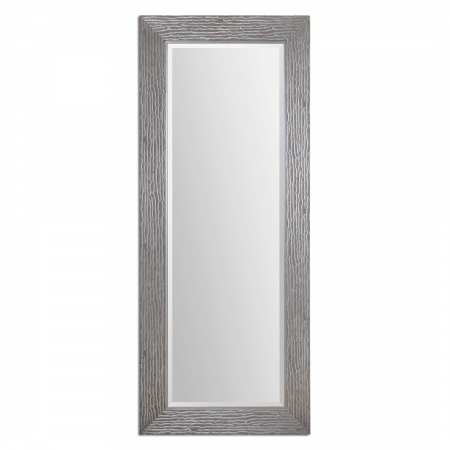 This full length mirror has a beautiful contemporary style with the metallic silver tone of the frame finish. The fir wood material has a thick wood grain texture that is enhanced by the heavy taupe gray wash over the silver finish. This natural pattern adds a nice decorative touch to the wide framework. A full length mirror is the perfect accessory for a bathroom or dressing area. The personal viewing space it provides is amazing. This function is complemented by the way the reflective surface adds such a feeling of spaciousness to the area. Material: Fir wood comes from a tree that is recommended for construction use indoors only as it has no decay or insect resistance after logging.